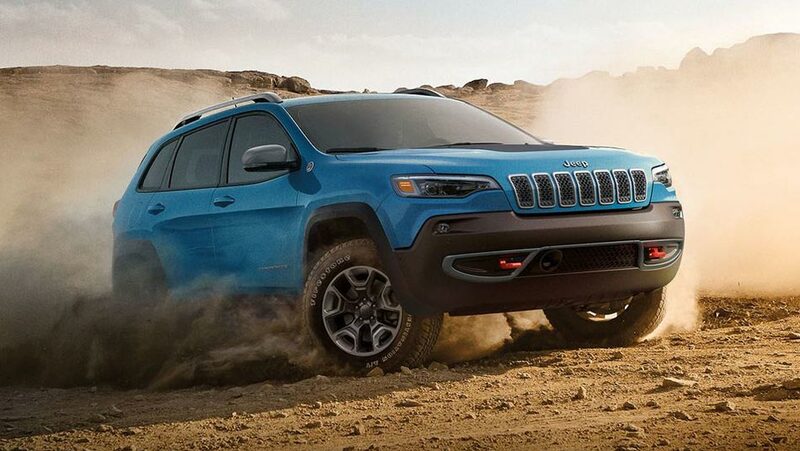 Rugged and refined—the ready-to-rumble Jeep® Cherokee tops our list when you’re looking for a vehicle that has offroad prowess, but can also maintain a sophisticated city ride. Whether you’re looking to plan your next adventure, or just looking for a little more cargo room in your life, the Cherokee has you covered. However, in 2019 the Cherokee has been treated to a refreshed exterior among other changes! Here at Southtown Chrysler, your go-to Edmonton Chrysler, Dodge, RAM, and Jeep® dealer, we’ve made shopping easy for you. We’ve done the research and put the 2019 Cherokee and the 2018 Cherokee head-to-head, to see which model year is superior! If you’re looking for a fresh masculine appearance, immediately turn to the front-fascia of the 2019 Cherokee. 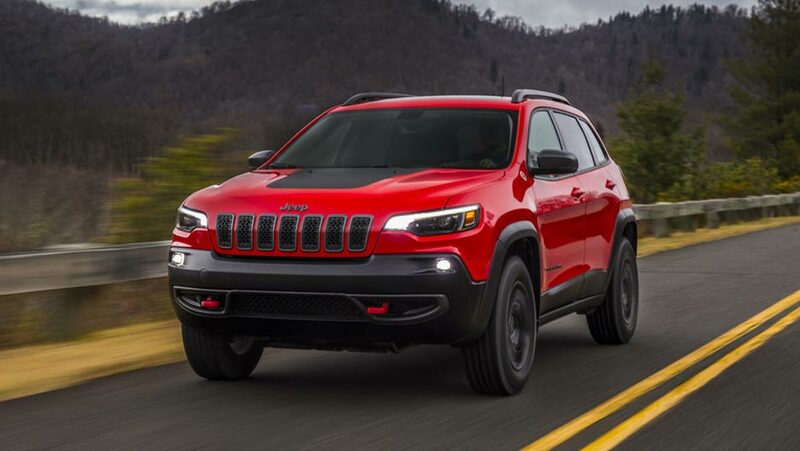 You’ll instantly recognize the classic 7-slot grille, however, Jeep® has retouched the Cherokee’s front-end to have a wide and commanding stance. You’ll also find new LED headlamps for the best in safety and security. For even more ruggedness, you can opt for the Trailhawk edition completing your Cherokee with a matte-black hood decal, red tow hooks, off-road suspension with increased ride height and—to complete your adventure—17-inch off-road tires. If you’re looking for even more luxury? The new 2019 Cherokee Overland has numerous premium features to please any driver, including new bright chrome tow hooks and 19-inch polished wheels. If you look back to 2018’s Cherokee, you’ll still get your 7-slot grille, however, look for a more aerodynamic front fascia sporting slit headlamps. Overall if you like a more masculine frame, opt for the 2019 model. Big changes are on the horizon for the 2019 Cherokee, as the redesigned front end now allows for a new 2.0L I-4 turbo engine. The turbo I-4 is good for 270 horses, 295 lb-ft of torque, and is paired with a silky 9-speed automatic transmission. The I-4 is a significant improvement on the Tigershark MultiAir2 (available on the 2019 and 2018 Cherokee) as it provides 90 more horsepower, 125 more pounds per feet of torque and a towing capacity of 4,000 pounds. With those stats in mind, the new engine alone makes the 2019 Cherokee stand out from it’s older counterpart. Toss in the Trailhawk edition that rides a Best-in-Class 4×4 capability, and you have yourself an off-road machine that sets itself apart from the pack. Though if you’re looking for straight pulling-power (the 271 horses and 4,500 pounds of towing capacity the 3.2L Pentastar VVT V6), the burly V6 is available on both model years and you may want to weigh out your options. Thanks to significant upgrades, the 2019 Jeep® Cherokee continues Jeep®’s ongoing dynasty of dominant adventure-ready SUVs. With the 2019 Cherokee, you’re getting the option of a turbocharged I-4 thats more efficient than its counterparts, a new masculine front-end, increased interior cargo volume, a new standard 7.0-inch touchscreen with Apple CarPlay™ and Android Auto™, and much, much, more. The 2019 Cherokee is likely your superior all-around option, however if that extra 500 pounds of towing allowed with the V6 is absolutely crucial to your Cherokee and you’re not as big of a tech-head, our 2018 models may be worth a look! Either way, we have both the 2019 and 2018 Jeep® Cherokee at Southtown Chrysler! Don’t wait to contact us for any questions about the Cherokee or any other of our models. Don’t forget that Southtown Chrysler services all makes and models, and has a massive parts inventory. Come on down!